Motor vehicle theft is or auto theft one of the most common forms of felony theft cases in Maryland. The legal name for the crime of stealing or attempting to steal a car is motor vehicle theft, but it is often referred to as auto theft, or grand theft auto. Police officers in Baltimore city, and in all jurisdictions make hundreds of juvenile arrests for motor vehicle theft each year. Motor vehicle theft has been glamorized in movies, television shows, and even in video games with the introduction of the Grand Theft Auto series. Despite what is depicted on television or in the movies, motor vehicle theft is hardly glamorous in the eyes of prosecuting lawyers. Motor vehicle theft is a felony with a maximum sentence of 5 years in prison and a $5,000 fine. Motor vehicle theft can be charged against a defendant who knowingly and willfully takes a motor vehicle out of the lawful owner's custody or control. Charges can also be filed if a defendant uses a motor vehicle without the consent of the owner even if the defendant intends to return the motor vehicle. This is often what prosecutors call joyriding, and what may seem like a prank or way to kill time can result in a juvenile being arrested and facing serious criminal sanctions. Motor vehicle theft arrest numbers are always rising due to increased technology such as Lojack systems and cameras on the roads. Auto theft or motor vehicle theft has some unique evidentiary rules that distinguish it from other kinds of theft. In order to protect potential victims, and streamline the trial process, owners of stolen vehicles are not required to testify in court at a motor vehicle theft trial. In order to prove lawful ownership, a vehicle owner need only to swear in court at a prior hearing that he or she owned or owns the vehicle. There are also certain defenses that are unique to motor vehicle theft and other defenses that are far more common and successful in Maryland auto theft cases and grand theft criminal cases. 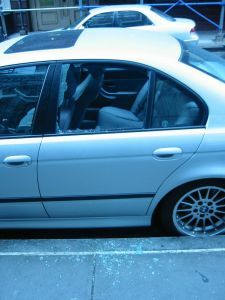 An auto theft lawyer in Maryland can explain these defenses in more detail. It is an absolute defense to the charge of motor vehicle theft that the defendant was the spouse of the lawful owner of the vehicle, unless the husband and wife were living in separate residences. It is also a defense to an auto theft charge that the defendant thought he or she had the right to use the motor vehicle. This defense often may be used when friends or family members of the vehicle owner are charged with motor vehicle theft. A defense lawyer may also present evidence that the vehicle involved in the theft is not an actual motor vehicle under the automobile theft laws. This defense can come into play if a car is not drivable or not intended for use on a road. Legally speaking, you dont have to steal an actual car to be charged with motor vehicle theft. There are many automobiles that can qualify as a motor vehicle for an auto theft charge. An experienced Baltimore motor vehicle theft lawyer understands the intricacies of motor vehicle theft cases, and can explain these rules in detail. If you or someone you know has been arrested for motor vehicle theft, or juvenile motor vehicle theft, contact The Herbst Firm at 410-207-2528.